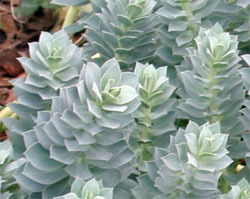 Euphorbia myrsinites is an interesting perennial with blue foliage. 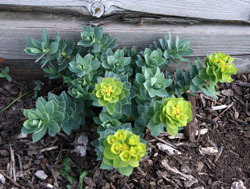 Variously called creeping spurge, donkey tail, myrtle spurge and other common names, Euphorbia myrsinites is an interesting succulent perennial in the family Euphorbiaceae (spurge family) native to rocky and grassy places of southeastern Europe and Asia Minor. 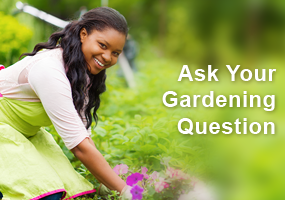 Depending on where you live it is a wonderful garden plant or a horrible pest. In England it has been given the Royal Horticulture Society’s Award of Garden Merit, but is considered a noxious weed in several western states and should not be planted in those areas. In the moister eastern US where it is less likely to be invasive, it can be a good addition to some gardens. It is hardy in zones 4-8. 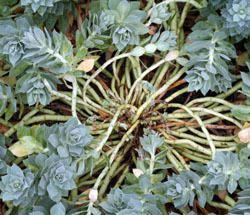 The pointed, succulent leaves are arranged in a spiral around the stems. upwards to 8”. In milder areas it is evergreen, but in harsh winters the leaves may die back to the crown. Individual plants tend to be short lived. The flowers that are produced in spring are typical of the Eurphorbiaceae, with clusters of inconspicuous, star-shaped yellow-green flowers within a collar of chartreuse to bright yellow bracts, sometimes suffused with pink, especially as they age. The clusters are produced on second year stems. Cut off old stems to the base when the flowers start to fade to prevent reseeding and to keep the plants more compact and tidy. The “flowers” are an inflorescence of conspicuous bracts surrounding the tiny yellow, star-shaped flowers. E. myrsinites prefers hot, dry sites. This plant prefers hot, dry sites, although it will grow in almost any sunny area. 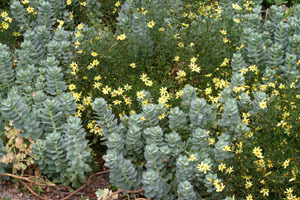 It is drought tolerant and does well in poor, rocky soil. It is well suited to sunny banks, dry walls, and rock gardens. Because of its low stature, it is great as a sprawling ground cover in the front of the border or as an edging plant or along driveways. It could even be used alone in terracotta pots or as a trailer in mixed containers for its interesting blue foliage. E. myrsinites readily reseeds and can be considered invasive in many areas. E. myrsinites readily reseeds and can be an aggressive plant, taking over large areas under favorable conditions if not deadheaded. The seedlings are relatively easy to control by pulling or hoeing, though. They can be easily transplanted when very small, but larger plants are harder to re-establish. 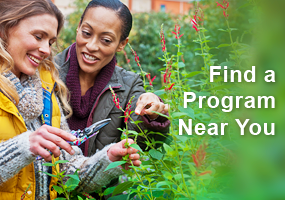 Plants can also be propagated by division of clumps in early spring or from basal cuttings in spring or early summer, but seed propagation is much easier. Stems sprawl on older plants. This plant has few pest problems, although aphids and mealybugs will sometimes attack, and bacterial or fungal rots can occur in moist conditions. Plants often sprawl or flop over as they get older, especially in richer soils, becoming rather unsightly when the crowns are exposed. This plant, like almost all other members of the Euphorbiaceae, has a milky white sap that is poisonous if ingested. Externally it can cause minor skin irritation or severe dermatitis in susceptible individuals. Wear gloves or wash the skin immediately if any sap gets on your skin. 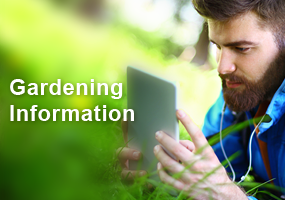 Be especially careful when working with this plant to avoid getting sap into cuts or in the eyes. I’m googling this because I’m having a horrible reaction to coming into contact with the sap. I washed my hands, but I guess I should have done so many times because I touched near my eye and now I can’t believe how burned my face is anywhere I touched. My eyes are watering (after using my allergy eye drop and taking an allergy pill) down my face and neck uncontrollably. Heading to an urgent care, It’s horrible! This is an evil plant. It’s noxious and should be banned from owning ever! If you get the sap on your skin, you won’t know it until about 20 minutes later. Anywhere you touched your skin after getting sap on will burn! It’s extremely painful! I was pulling it out of my boyfriends yard knowing what it’s capable of doing, and accidentally got sap in my eye. You can never know how painful it was! I rushed myself to urgent care, barely able to see. One eye was burning beyond belief and the other eye was crying because of the pain! I was lucky to have not gone blind. We have been trying for 4 years to get rid of this plant to no avail. He lives on 1/2 an acre and it’s still coming up. Do yourself a favor and do not buy this evil plant. Especially if you have children around. This can be a wonderful garden plant or a horrible pest. It is considered a noxious weed in several western states and should not be planted there. It is hardy in zones 4-8. Individual plants tend to be short lived. 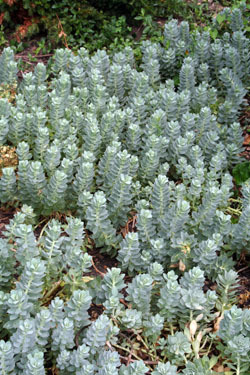 The pointed succulent leaves are arranged in spiral abound the stems. The plant prefers hot, dry sites, although it will grow in almost any sunny area. The plant readily reseeds and can be considered invasive in many areas.